One of the founders remembers how WNP got started. The idea for the Western Neighborhoods Project actually came to me in 1998. My family (me, lovely wife Nancy and one-year-old daughter Miranda) were in the middle of a regrettable nine-month stint of living in Durham, North Carolina. Back in San Francisco for a visit---so wonderful and heart-breaking to smell the fog, see the familiar vistas of stucco homes, walk through my hometown atmosphere---I started planning a way to get back. Chatting with my friend David Gallagher, I was awash in nostalgia for the Richmond District and I asked him why a small town like Belvedere in Marin County had its own historical society, but the Richmond District, full of thousands more people, small businesses, schools and synagogues, scandals and Halloween parades, did not. I knew from visits to the library that historical information on anything in the Richmond District that wasn't the Cliff House or Golden Gate Park couldn't be found. Yet, young guy that I was (33 at the time), I knew tons of stories from my neighbors about the area: drownings in Mountain Lake, Russian princesses living on Anza Street, long-gone streetcars and steam trains, cemeteries where Sears was, bankrupt furriers on Clement Street. Geary Boulevard was pronounced "Gary," and Arguello was "Ar-Gwell-O," and gosh darn it, shouldn't this all be documented somewhere? I thought a Richmond District Historical Society should be created. 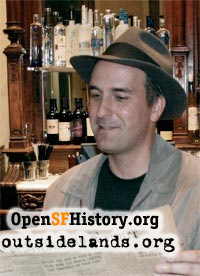 David thought an Overlooked Neighborhood Historical Society should be formed, embracing and celebrating other great neighborhoods like the Excelsior, Bernal Heights, Dogpatch and Hunter's Point. I guess we compromised and split the city in two, taking jurisdiction of the west side. That made sense to me, because while the Excelsior might as well have been Arabia to the Richmonders I grew up with, we shopped at Stonestown, ate at the Red Roof on Ocean Avenue, toured the Christmas lights in St. Francis Wood, and bought LPs at the Record Factory on Irving Street. I came home from the East Coast in September of 1998 and the paperwork to form the nonprofit was signed on May 15, 1999. David and I recruited a few other directors: Arnold Woods, an attorney and Richmond District resident; David's girlfriend (later wife), and my good friend, Brady Lea; and Felicity O'Meara, an Outer Richmond community member who believed in the whole idea immediately. We didn't know what to call the new organization, so settled on the pedestrian "Western Neighborhoods Project." About six months after incorporation it dawned on me that obviously "Outside Lands" was the correct name! Too late for the IRS, but our new Web site's URL changed from the very uninspiring "www.wnp-sf.net" to the Web address we all know and love. Over the past decade, the project has become more than a historical society, if it ever was such a thing. (I perhaps mistakenly imagine historical societies having more tea parties.) Some people think of us as a preservation organization, because we saved some earthquake refugee shacks; some think of us as a community improvement group because we attend neighborhood meetings, rallies, and festivals; and many just know this Web site, and have little idea we do more than post some old photos now and then. I have always wanted WNP to be (pardon the New Age term here) transformative. History is broad, personal, and relevant. History enlightens and inspires, engages and grounds, elevates and informs. I have made the case to many people over the past decade that local history is everyone's history and should be a part of art projects, community improvement plans, and city planning. WNP tries to do that. We also get out the word that San Francisco is more than North Beach and the Mission, the Gold Rush and Chinatown, Fishermans' Wharf and Alcatraz. There are San Francisco neighborhoods---full of both newcomers and oldtimers---that reporters and guidebooks and song writers usually don't notice, but they should. Click about a little on this site. Read the message boards. You'll see what we mean. Page launched 19 December 2008.